For mechanical filtration in the Evolve filters. There’s the option of the drop in Draco drum, but with an option for a brush box should the customer wish it or can’t afford to buy the drum combo in one. 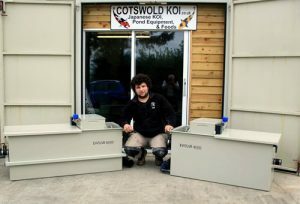 He has the option to purchase the basic Evolve filter with a brush box and simply drop a drum in when funds become available. 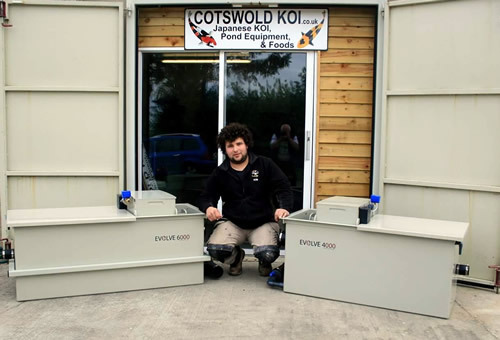 This I think makes the filter much more appealing to the majority of koi keepers that simply don’t have £2,000 to spare in one lump sum. 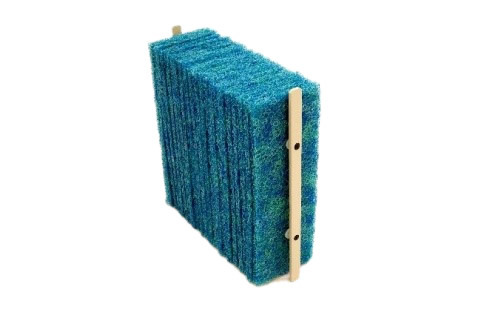 For choice of moving bed media in the Evolve filters we recommend the world proven technology of genuine K1, but the buyer can choose any other moving bed media if they have a preference. To contain this moving bed media there’s a set of lift out stainless steel baskets. 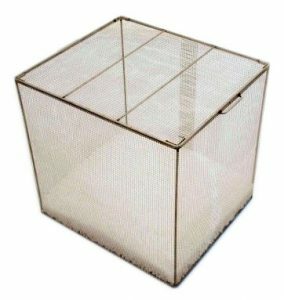 These baskets are available in three sizes to suit the different filters but all are interchangeable. The base of the biological stage has several air bars which the baskets sit on to provide the movement for the K1 and to ensure the water is oxygen rich. 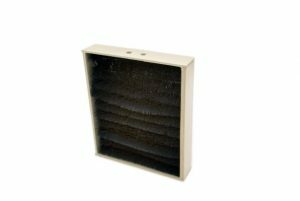 For the optional choice of bio media and again to make the filter appeal to more buyers we wanted to use genuine Japanese matting. However the standard 38mm Jap matting would not allow enough sheets into the filter. After lengthy negotiations we came up with a 15mm sheet, they take standard 38mm sheets add a little more binding agent and re compress it through massive heated rollers to form the 15mm sheets in 2m x 1m lengths. This forms a vastly firmer and more compact sheet allowing more than twice the amount into any given space. The 2m x 1m sheets can easily be cut and formed into cartridges to suit any size or shape of filter. 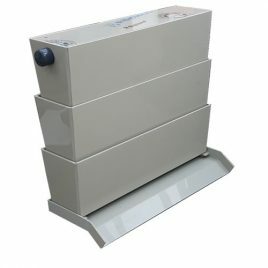 This cartridge holds 23 small sheets measuring 500mm x 250mm, in total that’s well over a 2m x 1m sheet in each cartridge. 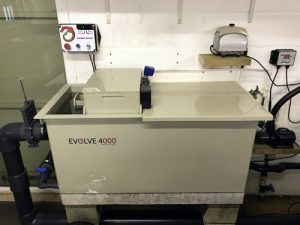 This biological Evolve 6000 holds 138 of my smaller sheets which equates to almost 6 2m x 1m sheets which is a vast amount of biological media and is suitable for going after any type of standalone drum. The Evolve 2000 has one biological bay i.e. space for either a Jap mat cartridge or a one bay stainless K1 basket. 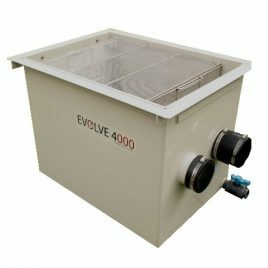 The Evolve 4000 has two biological bays i.e. 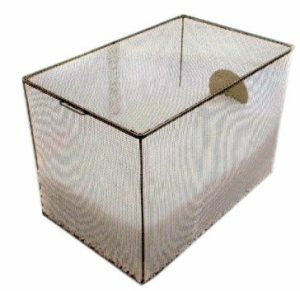 space for two matting cartridges or a two bay basket OR a matting cartridge AND a K1 basket. 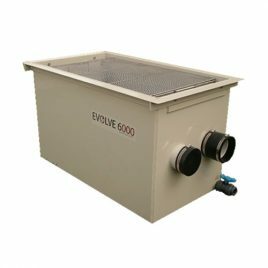 The Evolve 6000 has three biological bays i.e. 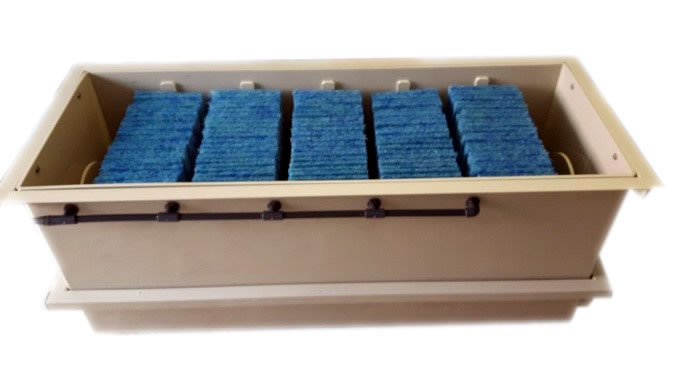 space for three matting cartridges or a three bay basket OR any combination of both. It’s impossible to give one set price for the filters because of the numerous options the customer can select. so please us the form simply select the options you want and add up the prices. 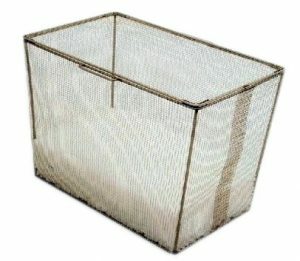 What size filter unit would you like? 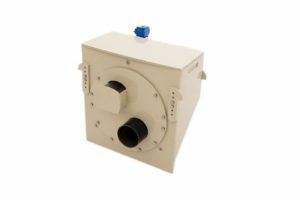 what mechanical filtration would you like ? How much k1 meida would you like? Any custom options you would like? Would you like a quote for installation ? The Evolve mini Bacteria Shower another great addition to the evolve range. Overall dimensions are; 540mm long x 250mm wide x 780mm tall. Supplied with a 2-inch removable spray bar should the user wish to drill more holes. Extra tiers can be purchased separately should a larger capacity shower be required. 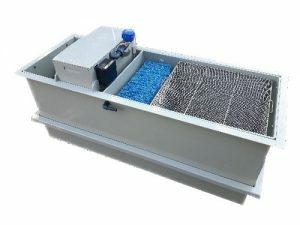 The Bacteria Shower comes with the standard waterfall type base to sit on the pond wall but can be ordered with a piped base if required to allow the outflow to be piped to a certain location. A two-spray bar top tier of the shower is available if extra water volume is required. This shower has a recommended maximum flow rate of 4,000 gallons per hour (18,000 litres). 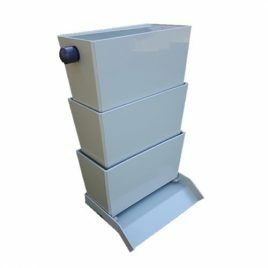 Evolve Shower 1000mm Three Tier Shower with full weir Base Overall dimensions are; 1000 mm long x 260 mm wide x 900 mm tall. Supplied with a 2-inch removable spray bar should the user wish to drill more holes. Extra tiers can be purchased separately should a larger capacity shower be required. The Evolve Shower comes with the standard waterfall type base to sit on the pond wall but can be ordered with a piped base if required to allow the outflow to be piped to a certain location. A two-spray bar top tier of the shower is available if extra water volume is required. This shower has a recommended maximum flow rate of 5,000 gallons per hour (20,000 litres). 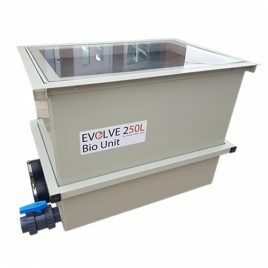 Evolve 250L Biological Chamber 900 mm Long 590 mm Wide 735 mm Tall Max volume of K1 or similar 250 litres This will allow up to 1,250 grams of food to be fed daily. 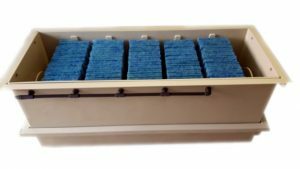 2 x 110 mm Inlets 2 x 2 Inch Outlets 1 x 2 Inch Filter Drain Units With Custom Inlet And Outlet Configurations Can Be Made To Order.